From Monday 26 February to Sunday 11 March 2018 an in-depth scientific examination of the Girl with a Pearl Earring (c. 1665) by Johannes Vermeer will take place: ‘The Girl in the Spotlight’. The museum’s most famous painting was last examined in 1994, during a conservation treatment. Although further restoration is not yet required, major advances in non-invasive technical analysis have been made over the last 25 years. The Mauritshuis hopes to learn more about how Vermeer painted the Girl with a Pearl Earring, as well as the materials that he used. The research will take two weeks and will be conducted in public at the Mauritshuis. The latest technologies will be used. 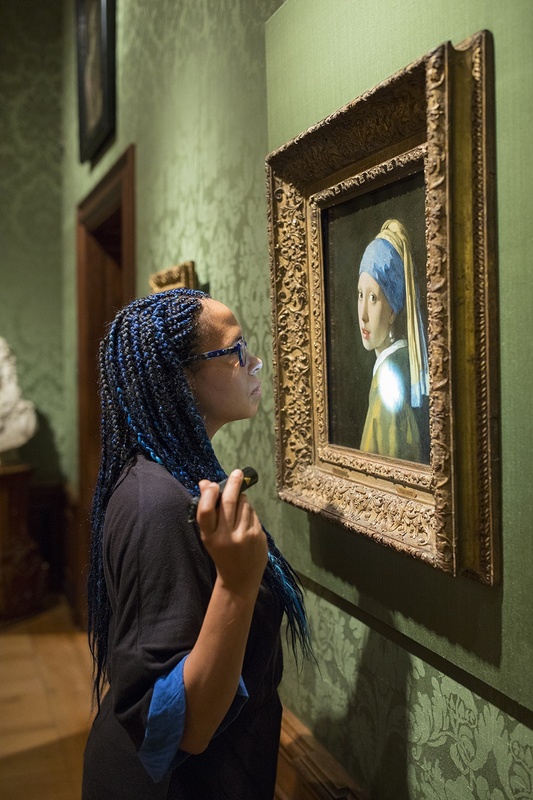 The research project The Girl in the Spotlight is a Mauritshuis initiative, and involves a team of internationally recognised specialists associated with the Netherlands Institute for Conservation, Art and Science (NICAS). The NICAS partners are Rijksmuseum Amsterdam, TU Delft, and Cultural Heritage Agency of the Netherlands (RCE). Other institutions involved include: Shell Technology Centre Amsterdam (STCA), Maastricht University, University of Antwerp, the National Gallery of Art Washington and Hirox Europe. Head researcher Abbie Vandivere: ‘It’s an honour to collaborate with such a team of experts, and to have access to the state-of-the-art equipment that they will bring to the Mauritshuis. For two weeks, the museum will house one of the most advanced research centres in the world.’ Some of the technologies that the project will harness are: MA-XRF scanning, optical coherence tomography and digital microscopy. After the two-week research period, the Girl with a Pearl Earring will be one of the best documented works of art in the world. For visitors, the project The Girl in the Spotlight will be a unique opportunity to witness the scientific examination of a world-famous painting. The painting may be difficult to view at some point during these two weeks, but a high-tech 3D reproduction by Océ-technologies will be on display so that visitors can take photos. Public lectures about the project will take place at 11:00 (in English) and at 14:00 (in Dutch) on Saturday 10 March. Beginning on Monday 12 March, the Girl with a Pearl Earring will be back on display in the usual location in Room 15. The research team will then continue its work by analysing the data. Final results will only be available after this analysis has taken place. The research project The Girl in the Spotlight is a Mauritshuis initiative, led by paintings conservator Abbie Vandivere, with a team of internationally recognised specialists working within the collaborative framework of the Netherlands Institute for Conservation, Art and Science (NICAS). The following NICAS partners are actively involved in the research: Rijksmuseum, Delft University of Technology (TU Delft), and the Cultural Heritage Agency of the Netherlands (RCE). Cooperating in this project are: Shell Technology Centre Amsterdam (STCA), Maastricht University, University of Antwerp, National Gallery of Art Washington and Hirox Europe. These institutions have made their equipment, expertise and research time available for the benefit of this project. NICAS is an interdisciplinary research centre initiated by the division for Physical Sciences of the Netherlands Organisation for Scientific Research (NWO ENW), within which art history, conservation and restoration, and sciences are united. This project is made possible with support from the Johan Maurits Compagnie Foundation. Image : Mauritshuis paintings conservator and head researcher Abbie Vandivere studies the Girl with a Pearl Earring. Credit : Mauritshuis.